Each winter the "December Dilemma" becomes a hot topic. This month, it seems like it's hotter than ever with every rabbi, Jewish educator, social worker, intermarried parent, grandparent of interfaith grandchildren, and children of intermarried parents writing about the subject. Perhaps the topic isn't any more popular this year than in years past, but just about anyone who wants to publish their opinion on the subject can now do so thanks to the openness of the Web. Jordana Horn took the harsh stance that families should not celebrate both Hanukkah and Christmas. Writing on the Kveller blog, Horn opens with the warning that "There is a good chance that this post will make you hate me. I don’t want to be hated but feel I should put this out there. Please do comment and do not take this post as insulting you: it is simply my viewpoint. The fact that I feel the need to put a warning on a blog post is, in and of itself, terrifying." I don't believe Jordana received any death threats after telling families they can't have it both ways and celebrate Christmas and Hanukkah together, but there were many comments that emanated from hurt feelings. Kveller even posted an opposing viewpoint in response to Jordana's opinion from a woman whose "agnostic family celebrates both Jewish and Christian holidays, despite the fact that such cross-practice is technically anathema to both religions." One interesting article written about the December Dilemma is by Paul Golin of the Jewish Outreach Institute and the co-author of How to Raise Jewish Children Even When You’re Not Jewish Yourself. Golin argues that people should stop telling intermarried couples what to do and what not to do during the winter holiday season. Now is the time of year when my wife and I renew our annual, uncomfortable conversation about why we will never have a Christmas tree in our home, despite her having grown up with one. I’m fairly crummy at explaining my reasoning, but we eventually remind ourselves that all marriages require give-and-take, and this is one time where she’s giving and I’m taking. However, I’ve never felt more like getting a Christmas tree than this past week, thanks to the trend in Jewish media of non-intermarried Jews telling intermarried Jews not to have Christmas trees. Articles like these make me want to put up a Christmas tree just to symbolize my defiance of self-appointed assimilation police. After reading these opinions I raised the question on my Facebook page: "Should intermarried families celebrate Christmas?" The respondents were mostly Jews by Choice who explained that while they don't have a Christmas tree or observe Christmas at their home, they do visit Christian relatives on Christmas and take part in the holiday's customs out of respect for family. One woman wrote, "We do both, and teach respect for all holidays around this time of year. Hanukkah is religious for us, christmas cultural and respectful of the grandparents who are christian. So far, no problems although lots of discussions." One question I often receive during this time of year has to do with affixing Hanukkah themed lights on the house. This question was raised by New Jersey Jewish News columnist Johanna Ginsburg in her 2003 article "To light or not to light." Many people get upset when they see "holiday lights" on a Jewish home. These holiday lights usually take the form of blue and white (somehow the official colors of Judaism) lights that could easily be mistaken for Christmas lights. 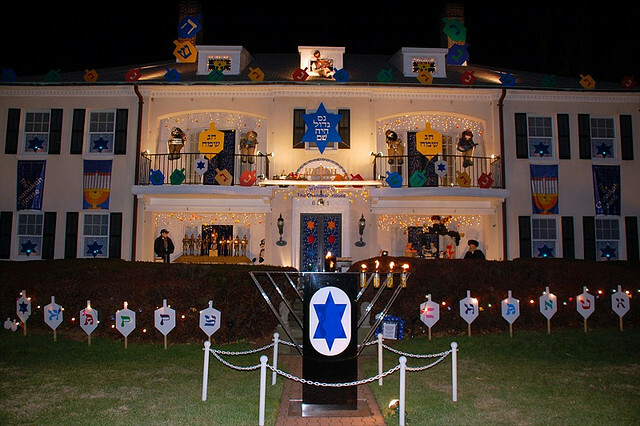 In Ginsburg's article the example was decorating the exterior of the house with LED lights in the shape of dreidels. In my opinion, hanging Hanukkah light displays outside ones home should not be cause for the alarm. The commandment of Hanukkah, as dictated in the Talmud, is Pirsume Nisa (to publicize the miracle of Hanukkah). We do this by lighting the chanukkiah and placing it in the window facing the street for all to see. In fact, this public religious display is a sine qua non for the proper performance of this mitzvah. Putting our Hanukkah candles in the window (or decorating our home with flashing lights in the form of dreidels or otherwise) is certainly a way to publicize the miracle of Hanukkah. We should also be grateful that we live in a country and at a time when we are able to freely publicize the miracle of Hanukkah. I really don't see the problem if some families choose to publicize the miracle of Hanukkah by decorating their homes with lights for a couple weeks in the winter (they should of course remember to put their lit Hanukkah candles in the window too). And if families that have non-Jewish relatives choose to join them on Christmas as they're celebrating their holiday as a show of respect, then that seems acceptable as well. We live in a time when most Jewish families in America include some non-Jews as well. 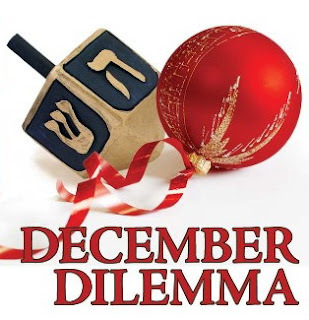 It would be wonderful if the "December Dilemma" stopped being such a dilemma. It would certainly make the holidays a less stressful time for everyone involved. Wonderful post, Rabbi Jason! In my humble opinion, much of our December dilemma can be resolved with careful attention to the other 11 months out of the year. Observe and teach about such holidays as Sukkot, Purim, Rosh Hashana, and Yom Kippur. Having this breath of knowledge throughout the year has helped my kids ( who are ages 4 and 2) know that their identity is bigger than just Hannukah vs. Christmas. I polled the three Jews in our non-intermarried household. All agreed that the bayit pictured did not give us a sense of shalom. It is merely competing with the garish commercial displays that have infected and adulterated Christmas. Neighbors outdo each other to see how grand their own son et lumiere can be. 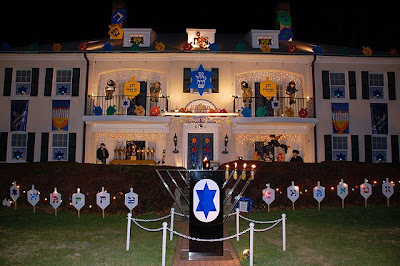 Put a hanukkiah on the front lawn, yes, but dreidels and menorah posters hanging from the rafters? C'mon. What's next, a huge balloon of Elijah's cup on the front lawn during Pesah? Wonderful post, and I wish I had seen it when my children were young. We had an intermarried, blended family. The dual celebration served to somehow direct 3 (of 4) of my Jewish children to celebrate Christmas only (not that they embrace the tenets of Christianity). I feel that our mixed celebration made it seem as if everything was okay, equal. The way I see it, it's clear that our "festival of lights" and Hanukkah miracle are actually kindred to the totally non-christian (actually pagan) "Christmas" lights and decorations at this darkest time of year. The fact is that we Jews and the larger culture are lighting candles in December is obviously related to the winter solstice and something that surely predates Judas Maccabee. There's no December Dilemma: "Honey it's cold (and dark) outside" - for everybody! Now, one nice menorah in the window, or one Christmas tree in the living room (for our neighbors), is an earth-friendly alternative to the extravaganza seen in certain neighborhoods and in the image of the Jewish home in this blog.